Back in the Luna days I used ibus to type in Japanese, and could switch between input methods using CtrlSpace. In Freya, I've tried to install ibus through the terminal, looking through the ibus page on the Arch Linux wiki and following instructions there, and all to no avail. Is there a way to get ibus working, or and alternative method that will work just as well? I found that ibus did not work with Freya. Instead I used fcitx with mozc for Japanese Input, using the instructions from the elementary os subreddit. NOTE: Make sure you remove the ibus package before you go through the folliwng steps, else the input-switcher will not work. Select "OK", on the dialog box that pops up. When asked to update user preferences, select "Yes". Select fcitx from the list, and select "OK". Restart your computer, and you should see an icon for fcitx in the wingpanel. 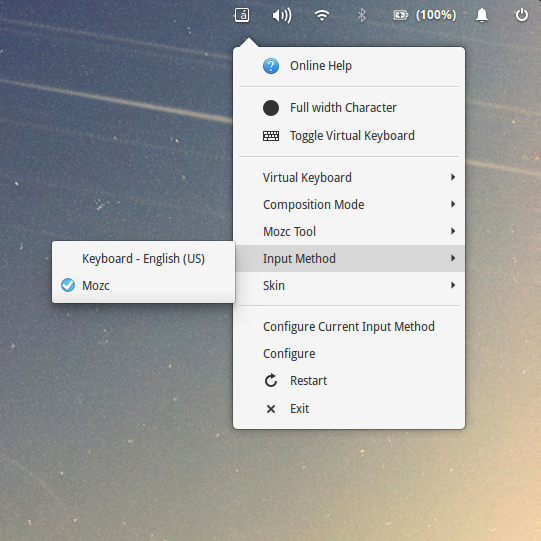 Click on the icon and if Mozc is not already under the Input Methods, click on configure. Click on the Plus icon at the toolbar at the bottom. Uncheck the checkbox for "Only Show Current Language". Search Mozc, and add it. Ctrl+Space is used to switch between inputs. If everything went well, you may have noticed that the icon for mozc by default is too big, so wingpanel will resize everytime you input with mozc. To avoid this, you can replace the icon with this smaller one in /usr/share/fcitx/mozc/icon/. You can download a copy of the mozc.png icon here, make sure you replace the old mozc icon with this. Once you replace it, open up terminal, and enter chmod 777 /usr/share/fcitx/mozc/icon/mozc.png, to ensure that the icon will be displayed properly. You can change the keyboard layout in System Settings > Keyboard > Layout and add a new layout there with the plus button in the bottom left. I have no knowledge of Japanese signs, but enabling a Japanese (Kana) seemed to work for me. 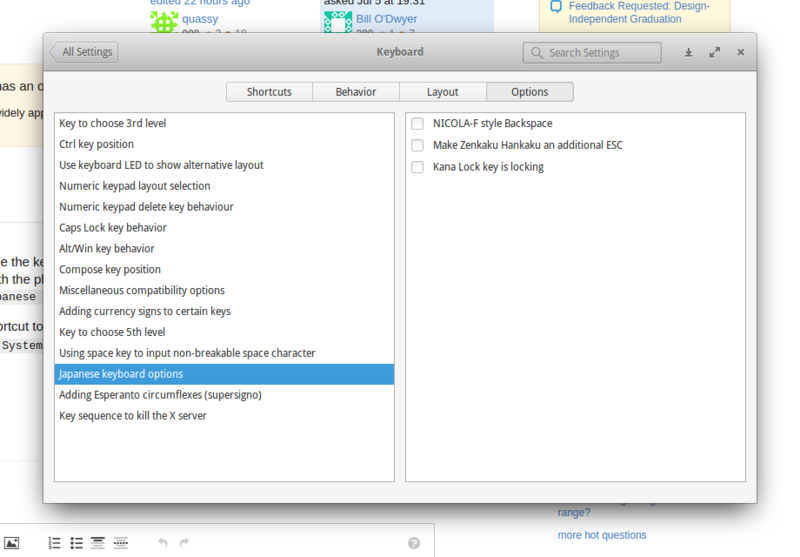 The default shortcut to cycle through different keyboard layouts in Freya is AltSpace. You can change this in System Settings > Keyboard > Shortcuts > Universal Access. Depending on whether you wish to use (discontinued but widely used) anthy or (maintained by Google) mozc input. Not the answer you're looking for? Browse other questions tagged input keyboard typing ibus or ask your own question.